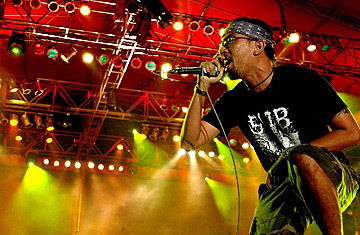 Arian13, of the metal band Seringai, performs at a concert at a Jakarta music festival, 2006. The kids rush the stage in a frenzy when the first thrashing chords of Burgerkill's five-song set blast out of the faulty sound system. They've waited all night for this, the headline act of Headbangers in Hell, a night that has featured Painkiller, Thrashline, Accidental Hero and 20 other bands. We're not at the Toledo Speedway or a dive bar in New York. This is JK7, the latest Jakarta venue brave enough to host the growing metal scene that forms just a small part of a burgeoning Indonesian alternative music scene that includes hundreds of indie pop, electronic and rock acts. More than 1,400 bands auditioned for the 12 spots on a recent compilation album called LA Lights Indiefest, all of them from far outside Jakarta. "The fact that independent bands are getting radio play and packing venues is a sign that things are really changing in the music industry," explains Ricky Siaahan, senior editor at Rolling Stone Indonesia and guitarist for Seringai, one of the hottest metal bands in the country. "Even my band is about to sign with a major label and there was a time when that was almost unheard of." Most indie kids would rather spend their money on imported CDs from bands like Interpol and Arcade Fire than on the drugs or discos with which their club-going peers prefer fill their weekends. Skinny pants and tight T-shirts are de rigueur for both sexes on the indie scene, as are asymmetrical haircuts. While there is conformity in their uniformity, the phenonemon is more than a trend. Indonesian teens are finding more kids like themselves on Myspace and Facebook  alienated from their local peers, many find solace solidarity in sharing the alienation of their global soul mates in Boulder or Brixton. Kids all over the world now have access to the same music, inspiring imitation and moving product  and local stations in Indonesia's main cities are catching on too. Local alternative acts are suddenly racking up sales in a market once dominated by boy bands and balladeers. Mocca (from Bandung) sold more than 75,000 copies of their last album, while Superman Is Dead, from Bali, reached 65,000 with their last effort. Those numbers are dwarfed by multi-platinum acts such as Peterpan and Dewa, but their success is drawing attention. Unlike its more affluent neighbors, Indonesia has not benefited from wide distribution of foreign music, forcing local kids to make their own music. Compared to Thailand and Japan, a wider command of English in Indonesia has allowed kids to explore what's available on sites like Myspace, Friendster and Allmusic.com. And, with fewer government restrictions than Malaysia or Singapore, the environment is more permissive for performing live. The resulting spirit of freedom has spawned a scene in the capital called "underground" not because it's illegal, but because if you're not looped into its social networks, chances are you won't be able to find it. Bands pop up to play at outdoor stages, abandoned music schools and sweaty auditoriums, usually with little or no promotion. But the thrill of arriving at a venue and knowing you're in on one of the city's best secrets helps sustains the scene. Corporate advertisers have begun to sense the allure of the alternative  Goodnight Electric launched its second album kitted out in Adidas sportswear from from head to toe  and so have radio stations. Several stations now have regular indie shows, and some, like Prambors FM, even broadcast live sessions. Acong, also known as Sir Dandy, recently performed on the program with his band Teenage Death Star. "We couldn't believe they asked us," confesses the musician who doubles as a painter and stage designer. "This is a format that didn't exist a few years ago because few were willing to take the chance on music like ours." Still, those at the heart of the scene fear that their audience may not be willing to pay the admission fees necessary to sustain it. When two little-known Scandavian bands recently played in Jakarta, the kids were willing to shell out $40 for the show, while a gig with five local bands would struggle to charge $5, even with a free drink. "The kids have to realize that the scene will only survive as long as they support it," adds Keke. "The bands may be local but that doesn't mean they're not as good as foreign acts." The need to sustain the scene is clearly on the mind of the MC at JK7 as the mosh pit swells for the head-banging headliners. "Feel free to express yourself," he screams from the stage, "but please don't destroy the place. These bands were born from your support and if you keep things under control the scene is only going to get bigger."